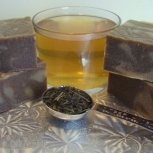 Rose hip & petal tea, shea butter, sunflower & coconut oils, sodium hydroxide, safflower, palm, palm kernel, apricot kernel & rose hip seed oils, French pink clay, ground rose, lavender & hibiscus flowers, vitamin E, grapefruit seed & rosemary extract, rosewood, palmarosa & rosemary essential oils. 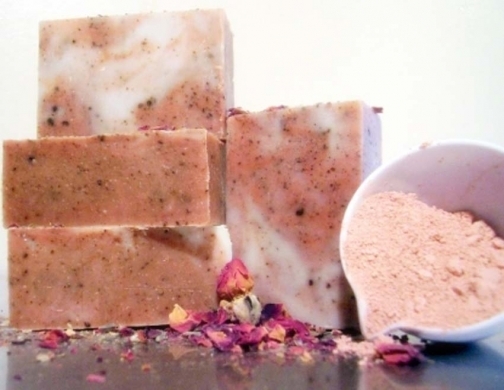 This nourishing bar combines shea butter & pink clay. 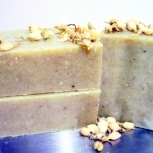 Shea butter is a deeply penetrating moisturizer. French pink clay is mild & gentle enough for sensitive skin. It exfoliates & cleans pores with the help of ground rose, lavender & hibiscus. We’ve added vitamin-rich rose hip seed oil to balance & soothe stressed complexions. Ideal for tired & aging complexions. These bars are loaded with food for the skin... just read the materials. 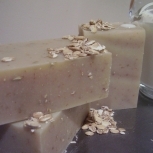 We DO NOT "fill out" our soaps with low grade oils or fats (like canola, rapeseed or tallow), or synthetic emulsifiers, detergents or surfactants (like propylene glycol, SLS or sodum stearate). We use only essential oils, NEVER fragrance oils or perfumes (which can contain anything that does not appear on the label). Our ingredients are listed in order of percent of content, so you know what you're getting! Item ships from: Welsford, NB, Canada. $9.00 CAD ($0.50 CAD when combined with another item) by Canada Post. Expedited Rate: $9.00 CAD ($0.50 CAD when combined with another item) by Canada Post. 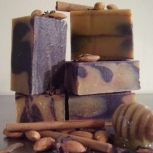 Your soaps just look amazing!! And without fragrance is a huge plus - I'm owner of a holistic school...and from having a family with chemical sensitivities, and learning the dangers of chemicals over time on the human body, your soaps are a divine gift. I will exchange items that are damaged or otherwise not as described when notified within 14 days of original shipping date. Buyer pays shipping to return the item and send the new item.